AR-V6100FL adopts Acrosser’s expertise of design for in-vehicle applications. These designs include smart power management, high efficient thermal module, and diversity of integrated communication technology such as CAN bus, Wi-Fi, 3.5G wireless WAN, Bluetooth and GPS. AR-V6100FL is protected with the most complete power input protection to adapt the harsh electrical environment in any kind of vehicle. Such protections are automotive transient voltage suppression, over/under voltage protection, over current protection, reverse voltage protection and automotive fuse. These designs enable AR-V6100FL to pass the strict ISO-7637-2 test which is specifically defined for equipments installed in various vehicles. 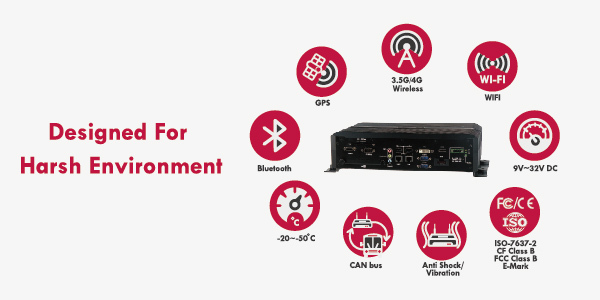 The smart power management subsystem enables user to define the power on and off sequences through software interface or BIOS setting to meet any requirement of in vehicle applications. Driver of vehicle can trigger the power on and off sequences by either ignition switch or a remote switch.